We (Rajesh,Bappa,Sadhan,Aritra and I) went to Gangasagar on 11th December (Saturday) 2010 with Aritra's new Mahindra Xylo! We left little late around 10 p.m. 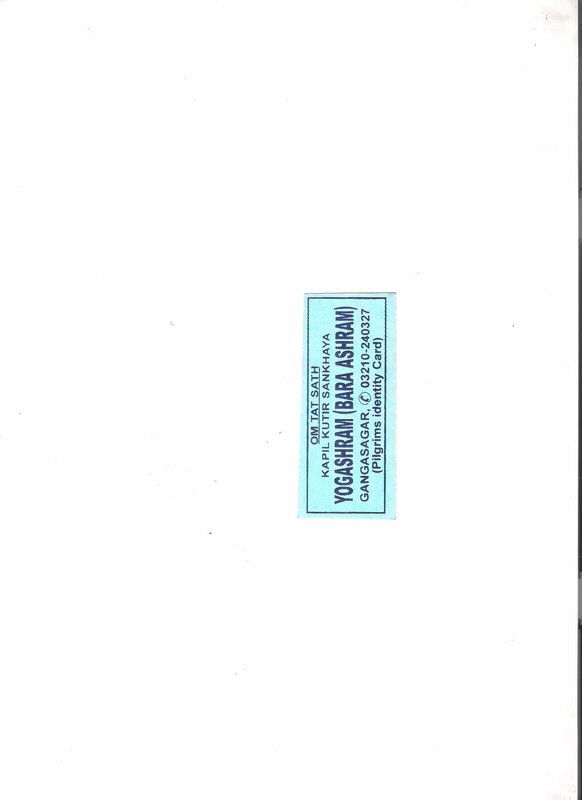 Since Bharat Seva Shram has an Ashram their - my dad's friend Somesh Bose was of great help to us. We contacted his friend to help us, once we reach Gangasagar. 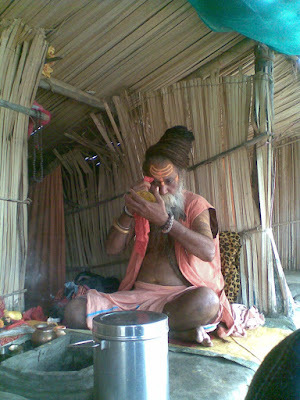 GangaSagar is famous religious spot, as its on the confluence of River “”Ganga”" (Ganges) and Bay of Bengal. The most prominent site is Kapil Muni Temple and people take holy dip at the sea after offering there prayers at the temple. Though there are other Ashram’s and Temples too. 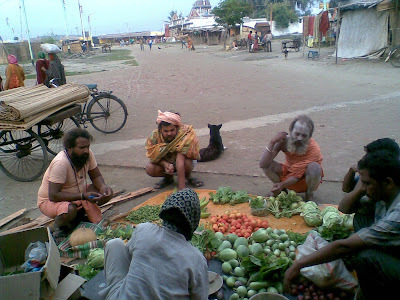 The biggest attraction of this place is “Ganga Sagar Mela(Fair)". that happens during “Makar Sankranti" every year. This Mela is the largest human gathering after "Kumbha Mela(Fair)", and its also called Ardha Kumbha Mela(Fair).However at this point of the year there is hardly any tourist. It is the the largest fair of of West Bengal . 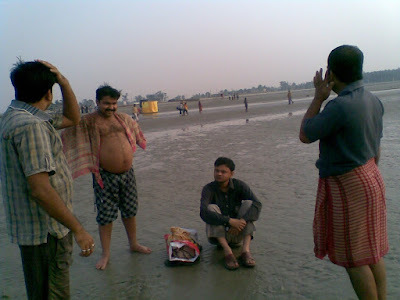 Gangasagar Mela is a 3-day event held in mid-January, on the occasion of Makar Sankranti, at Sagar Dwip. Lakhs of pilgrims come for a holy dip at the confluence of the Ganga and the Bay of Bengal. Makar Sankranti : Makar Sankranti falls on the day of the year when the sun-considered the king of all grahas (planets)-is in the rashi (zodiac sign) known as Makar (Capricorn). This is considered the most beneficial and auspicious zodiac of the sun. The calculations for determining Makar Sankranti are done according to the solar calendar. Therefore, Makar Sankranti always falls on the 14th January according to the English calendar. Initially, we struggled through the dense traffic up to Diamond Harbor and the roads were bumpy roads.We had our lunch at Diamond Harbor at around 1 pm.At Ferry Ghat we kept our Xylo. After that we crossed the river by ferry which took more than half an hour to cross the river. The distance between the two shores was quite large so it was difficult to think that it was a river. It seemed to be a part of the sea. After much bargaining for charges with the driver (on the other side of the river) we hired aMaruti Omni, who took us to Ganga Sagar. Once we reached the bank of Sagar Deep, the route to Ganga Sagar (the confluence of Ganges with the Bay of Bengal) was around 30Km. 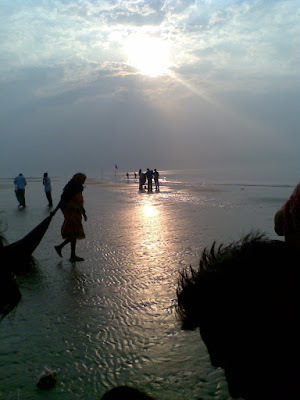 Once you reach Sagar Island, it will be journey through a very quite country side, a traveler’s delight. The Omni taxi took more than an hour to arrive at the site of Ganga Sagar. Having arrived at Ganga Sagar, we first booked a room Ashram for the night halt at Yogashram (Bara Ashram - Kapil Kutir Sankhya, Phone No. 03210 - 240 327) near Kapil Muni Ashram. The room was quite basic, but the Ashram complex is very pleasant. Keeping our luggage in the room we went to the sea beach. Then we took the ‘Darshan’ of Kapil Muni in his temple as it was the ritual. In the evening we had a long adda session beside the Kapil Muni temple with usual snacks (tele bhaja). There are number of temporary Akhras beside Kapil muni Ashram. Some of the saints/sadhus have already arrived. What I found intriguing is that Kapil Muni is an atheist and Sankhya has its roots in atheism. The fact that Kapil Muni is worshipped is a mockery of his philosophy! Early in the morning my friends went for taking bath in the sea. The sea is quite clean at this time. But after 1 month it will be filthy like anything. Aritra and I refrained from taking bath so early in the morning. After having our breakfast we left for Kolkata. Everyone expected it to be a boring trip, especially when we were going to a religious place, but the religious place is famous for beach too and that quite made up the whole affair! Just in case, you are planning to travel on a car then make sure you reach “Lot Number 8” by High Tide, as the Ferries carrying heavy load operate only during high tide. The reason for this is that sea bed is shallow due to Ganges deposits of mud and sand at this place.